ANNAPOLIS, MD (January 1, 2015) – Named for its distinct dark and light striped shell, the zebra mussel (Dreissena polymorpha) is a small, triangular freshwater bivalve mollusk that attaches to hard surfaces with hairs called byssus. Like many other nuisance species, zebra mussels are prolific and form dense clusters, often covering whatever surface they attach to several inches thick. Zebra mussels have caused serious problems in the Great Lakes and other water bodies where they have invaded. They have encrusted boat hulls and outboard motors, clogged power plant cooling water intake pipes, and forced expensive changes in the way municipal drinking water supply systems operate. Zebra mussels can kill native freshwater mussels, alter aquatic food webs, and affect water chemistry. 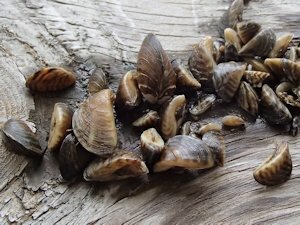 Zebra mussels can also accumulate nutrients and toxins within their bodies, which has contributed to the deaths of thousands of fish-eating birds and to blooms of harmful Mycrocystis bacteria. Maryland DNR recently completed a count of the zebra mussel population found in Maryland waters. For these reasons, zebra mussel has been chosen as Maryland Invasive Species Council’s January Invader of the Month. The zebra mussel is a small (< 25 mm shell length) native to southern Russia and the Caspian Sea. It was first discovered in North America in June 1988, in Lake St. Clair on the Michigan-Ontario border, likely being a passenger in ballast water from a transoceanic cargo ship. Since this inadvertent introduction, zebra mussels have spread as far west as California, and now occur in at least 25 states, including Maryland. Immensely fecund, these mussels can reproduce quickly, and can be moved in water bodies and between water bodies by attaching to boats, trailers, and aquatic plants. Unlike native bivalves, zebra mussels are dioecious spawners, releasing tens of thousands to millions of gametes in the water column when water temperature approaches 15ºC. Their larvae, called veligers, may be free swimming for up to a month before settling out of the water column. To survive, the settled mussels attach to hard substrate using byssal threads. They live attached for up to 10 years and grow about 1-2 cm per year. Zebra mussels become sexually mature their first year. In November 2008, 20 years after showing up in North America, zebra mussels finally arrived in Maryland. A single adult mussel was found at the Conowingo Dam in the lower Susquehanna River. Less than a month later, a second mussel was found on a boat hull at Glenn Cove Marina, in Harford County, Maryland. Between 2009 and 2013, a few more zebra mussels were found scattered throughout the upper Chesapeake Bay. With fewer than 50 live and dead specimens reported, the zebra mussel population, although apparently established, did not seem to be expanding. In the fall of 2014, however, results from monitoring a network of buoys and anchors that are located throughout the lower Susquehanna River and upper Chesapeake Bay changed the picture. On 15 anchors located in tidal-freshwater, researchers found more than 500 zebra mussels. In 2012 and 2013, those same anchors sported only 14 and 20 mussels, respectively. Not only did the numbers increase, but the distribution widened: in 2012 and 2013, all the zebra mussels found came from only three of the 15 anchors surveyed; this year, 14 of the 15 contained the invasive mollusk. Watermen who fish the Susquehanna Flats also reported mussel-encrusted gear. There is no evidence that zebra mussels in their current numbers are causing ecological harm in the waters of Maryland where they have been found so far. They are likely causing minor economic impacts to water users who must inspect, monitor, and clean intake pipes periodically from fouling. In the coming years, recreational boaters, commercial fisherman, and marinas will likely find they must spend additional time cleaning outboards, hulls, trailers, mooring anchors, or any hard surface that is in infested waters for more than a few days. Typical treatment methods for zebra mussels involve physical removal, chemicals, and molluscicides. A recent zebra mussel-specific product has been used with some success at eradicating them from small parts of closed bodies of water like ponds and lakes. Ways to reduce the effects of zebra mussels around local areas of value, such as water intakes or marinas, requires continuous treatment and can become expensive. Research in the 1990s in the Great Lakes region explored the use of hormones and phytoplankton-generated chemicals to disrupt the zebra mussel reproductive cycle. Currently, there is no method ofcontrolling zebra mussel populations in an open water system like the Susquehanna River or other freshwaters of the Chesapeake Bay drainage. The spread of zebra mussels through Maryland waters can be slowed or even stopped. DNR is asking citizens to help prevent the spread of this notorious non-native species by following several simple guidelines listed on the Stop Aquatic Hitchhikers signs posted at boat ramps and marinas in zebra mussel-infested areas. REMOVE all visible mussels and aquatic plants from your boat hull, external drive unit, propeller, trolling plates, anchor, trailer, and fishing tackle; put debris in a trash can well away from the water body. DRAIN all water from live wells, bilge areas, bait buckets, SCUBA gear, and coolers. FLUSH engine cooling system, drive unit, live wells, bilge areas, bait buckets, and coolers with hot water, if available. RINSE boat hull, trailer, fishing tackle, and SCUBA gear with hot water or a hard spray from a garden hose. DUMP left over/unused bait in a trash can; DO NOT dump or release it live to the water body. DRY your boat, engine, trailer, fishing tackle, dive gear thoroughly for at least 5 days between outings—-longer if possible. These steps could help assure your favorite body of water stays zebra mussel free. For more information about zebra mussels, go to USGS Zebra Mussel NAS fact sheet.